We live in a world that is hyper-competitive, and yet, while technologies can provide tremendous advantages, the ultimate technology is still the psychology and skills of the business owner or leader. Is cash flow really the problem? Here’s how to overcome the number-one obstacle to growing any business. Watch this six-minute video to see how Tony Robbins helped Shane — a participant in the Business Mastery bootcamp program — reframe his thinking about this challenge so that instead of an obstacle, he saw an opportunity. Whether you’re a fledgling company or an established brand, you’ll learn how to overcome hurdles in the business world from this recorded session from Tony Robbins’ seminar “Business Mastery” Tony tells the audience that above all, your success depends on developing a business mindset, instead of giving in to false assumptions. Having an entrepreneurial mindset can positively impact your company and its cash flow. Instead of thinking you’re incapable of accomplishing your goal, why not shift into a business mindset? Challenge your perceived limitations and choose to believe in your vision. Ask yourself, “Is this assumption really true?” Tony Robbins believes that the only true chokehold on any business is not cash flow, but the business owner’s limited psychology or skills. That means that if you have all the external resources you need but are still failing, it’s time to look at your mindset or your skillset and reevaluate the situation. The worst thing business owners can do is play into beliefs that might be untrue. If you believe there is a problem, and spend all of your time worrying about it instead of taking action, then you’ve already failed. Find the unspoken assumption that’s causing you distress — what is it? The best way to face your fear is to face it head-on. To overcome business obstacles, you must identify if your limiting belief is true. Is this assumption true? Why or why not? Dive into exploring whether or not this is an environmental limitation, or, in fact, a psychological or skill-related one. It could be psychological if you have the resources to acquire more money and are simply feeling anxious about doing so, or perhaps you’re worried you don’t have the skillset to reach out to potential shareholders. Oftentimes, after challenging an assumption, you’ll find it’s not true and you have everything you need to succeed. What would you do to succeed if you knew you could not fail? After identifying whether or not the limitation is real, it’s time to identify your goals. What do you want to accomplish with your brand? Is the goal to have more time for yourself or to make more money? After establishing clear objectives, and building up a can-do entrepreneurial mindset, you’ll be able to achieve your goals. Looking for more business advice? 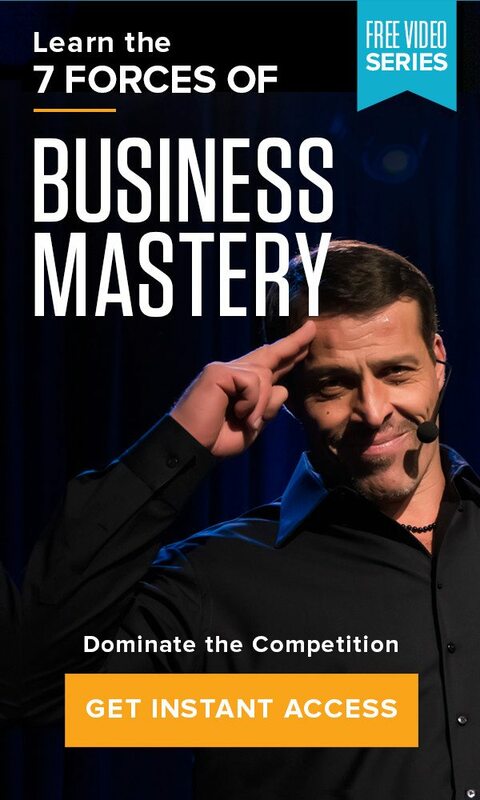 Find out how to achieve your professional goals by accessing Tony Robbins’ 7 Forces of Business Mastery today.